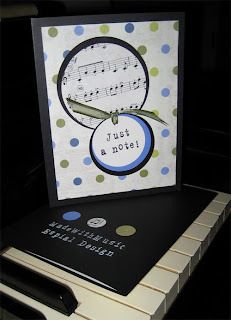 I'm attending the Western Washington Scrapbook Retreat next weekend for 3 days of dedicated creative time. I'm not a scrapbooker intrinsically, although I do enjoy making my own greeting cards. To get into the groove, I signed up for the event's card swap. My inspiration was my piano. I've never been very good and don't have an ear for music, but I enjoy plunking on the keys once in the while. I have TONS of sheet music from my Grandma, my Aunt Judy, and my mom. I went through it yesterday to see what could be deemed collage worthy and found some goodies to cut up for my project. I made 14 cards in total. These are so cute! Aren't you glad I suggested you join!